I've spent about 3 hours today thinking about the electric field created by two like charges. I didn't spend all that time thinking about it because it's a particularly interesting topic, nor is it terribly hard for me to envision. I spent the time thinking about it because I want a good image of the field that is a.) useful for my students and b.) available for me to use without bending any copyright laws. I've been mostly generating my own artwork for classes (with the side goal of creating a CreativeCommons licensed library for people to make use of) but creating an electric field diagram isn't something that can easily be whipped up in a drawing program. After quite a bit of searching for images labeled for reuse, I happened to find a python program that can be used to create vector field plots of various electromagnetic configurations. Awesome, right? I even found an example code of the field that is generated by one positive and one negative charge. What I wanted was the field around a set of like charges, but I can read source code and figure out how to change a negative sign, right? Wrong. I need to spare myself the embarrassment of posting my attempts to correctly plot the field, but know that it went from bad to worse. Unfortunately, I wasn't too thrilled with the horizontally oriented field line right in between the two charges. 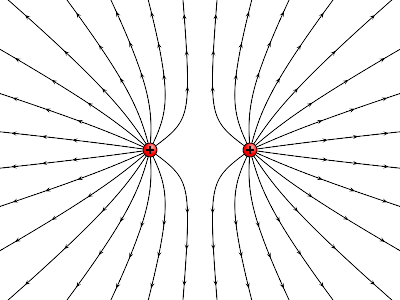 The electric field is zero at a point equidistant from the two (identical) charges. And while, the arrows are pointing in opposite directions along this line, I'm not sure if it is obvious to my students that the electric field at that point is zero. 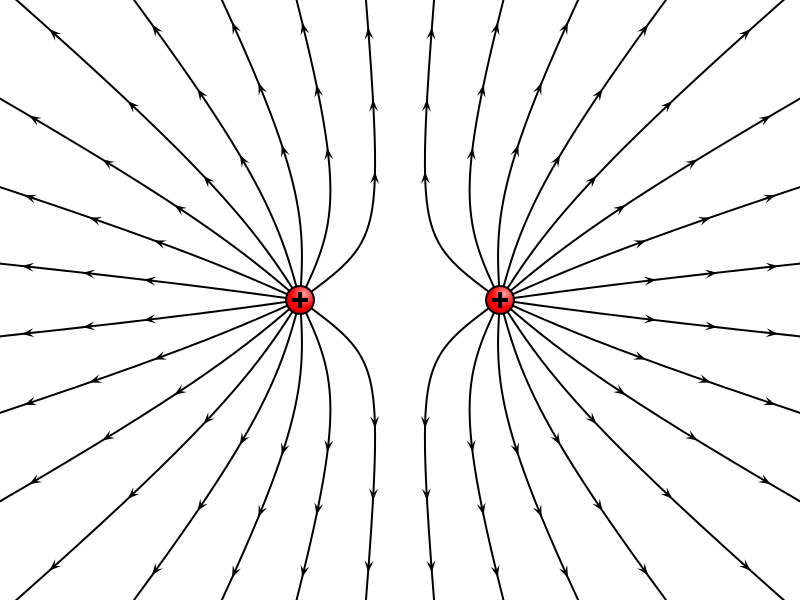 Gone is the electric field line in the middle and added are more vectors. It's not perfect, but I'm not sure I can spend more time finding the perfect representation anymore. Another quarter has come and gone already. At the end of each term, I like to look back at what I've tried to do in the class and figure out what worked, what didn't work, and what I can do to improve for the next quarter. "Reading Quizzes" due at 8:00 am every day of class. Okay, I'm still not convinced that the students are actually reading the text as much as I want them to, nor do I necessarily like calling them "Reading Quizzes" but I do get great information about what is generally the most confusing aspects of the material that we are going to cover. I'm going to try to improve these by off-loading some of the clicker questions onto the "Reading Quizzes" in an attempt to make students confront their misconceptions and gaps in understanding. The Interactive Lecture Demonstrations were not as effective as I had hoped. They took too much time and the payoff wasn't what I was hoping for. I may try a few more, but I'm also thinking that I need to attend one of their workshops to see how to do them better in class. I had a rough Fall quarter. At the end of that quarter I felt that I knew less about teaching than I did at the start of the quarter. Part of the reason I reflect on what I've learned about teaching each quarter is an attempt to get better at teaching. Before last Fall, every single term I had taught I felt like I was carrying forward lessons which I had learned and was therefore becoming a better teacher. But my Fall quarter was pretty much the opposite of everything I had ever before experienced. Strategies which worked well in the past crashed and burned. Students were frustrating and became closed to trying new ways of learning. I tried adapting, I really did, but in the end I felt like the students and I were just surviving the class and each other. This past quarter was a much better experience. True, the classes were smaller, probably in part due to the students wanting to get as far away from a bad teacher as possible. The students who remained were more willing to engage in the material and I feel that the class got deeper into the material this quarter than last. I hadn't changed much in the way of what I was doing in class. There were a few minor tweaks here and there, but overall the class was largely the same experience. As this Winter quarter was drawing to an end I was trying to figure out what I had learned about teaching that would carry forward to next quarter. It was then that I realized the main difference between the two quarters was that somehow I had connected with the students in the Winter in a way that I had not in the Fall. I'm still not sure what the difference was in HOW I connected with these students. The point is that, when there was no connection, the class was disengaged and uninterested in learning. The more connected I felt to the class, the more willing to engage with the material they seemed to be. It seems so obvious now that it is almost silly that I had to learn this lesson for myself. I know in previous environments I've been in it has been easier to connect with students. I don't know why it was harder last Fall, and in a sense it doesn't really matter. I just need to remember to be cognizant of how the class is getting along with me so that we can't concentrate on learning. I just finished reading Mindset: The New Psychology of Success by Carol Dweck. It has changed a lot about how I think about learning and personal growth in my life (both professionally and otherwise). I'm trying to implement the idea of having a "growth" mindset in all I do for my classes and my research. It's hard work, but I guess that's part of the point. How teachers put a growth mindset into practice is the topic of a later chapter, but here's a preview of how Marva Collins, the renowned teacher, did it. On the first day of class, she approached Freddie, a left-back second grader, who wanted no part of school. "Come on, peach," she said to him, cupping his face in her hands, "we have work to do. You can't just sit in a street and grown smart....I promise, you are going to do, and you are going to produce. I am not going to let you fail." Robert Talbert recently asked about the responsibilities of students and instructors in college. I don't know if I have a set answer to his question, but I do believe that if students are willing to put in the effort to do the work that I ask them to do in my class, then it is my responsibility to provide whatever assistance they need to be successful in learning the content in my class. You've seen the videos that Vi Hart has been producing featuring what she calls doodle games related to various topics in math, right? They made the rounds of the science and physics blogs towards the end of last year and beginning of this year. But, here's what you might not know about Vi Hart: her father is George Hart, a former professor at Stony Brook University, a sculptor, and the first director of the soon-to-open Museum of Mathematics. What that means to me is that Vi grew up in an environment where curiosity about mathematics was nurtured and developed. It also indicates to me that she has been working for a long time to develop her talents. Those last two points are not criticisms, they are merely observations. I do take issue with her underlying commentary on the state of math education (and really, school in general) which is that classes are boring and taught by incompetent teachers, and that students would get more out of class by not paying attention and just playing some doodle games. I'm not even sure I disagree with her (completely) on those points, either. What I disagree with is the notion that anyone learns anything from watching her videos. She talks too fast for most people to be able to maintain comprehension all the way through the video and there are many terms which are unfamiliar to non-mathematicians which fly by as the video is playing. I wanted to better understand what the doodle games were all about, so the first thing I did was I tried creating some doodles on my own. (If her only goal in these videos is to get people to try out the doodles, then maybe they are working better than I give her credit for.) I was able to follow the first two doodle games in the above video, but I wasn't able to get the shading right on the third doodle game. More frustrating to me was that I couldn't really understand the importance of the doodles. In the video she mentioned knot theory and weaving but I could never quite catch what it was she was actually saying about all of that. I went looking for a transcript of the video, but I couldn't find one. So, I sat down at my computer and banged out a transcript myself. I learned a few things by doing that. One, I learned that one of the figures she mentioned in the video is called a Ouroboros. I had no idea what she was talking about when I had watched the video, but by piecing together the transcript I was able to get the correct spelling and look it up online. After I had the transcript complete, I started looking into all the topics she mentioned in the video. My digging eventually turned into this post at metafilter which was well received by the community over there. In finding the links which went into the post, I was able to dig a little into topics like knot theory and topology which I had previously known next to nothing about. I definitely appreciate that the video brought these ideas to my attention so that I would be inspired to learn more about them. The thing is, though, it took a lot of my time to read up on those topics. I was constructing the metafilter post for over 2 weeks, working an hour or two every night in my free time. I learned a lot because I put in the effort to do so. I'm willing to bet that Vi Hart has put in thousands of hours of study to cultivate her passion and talent for math. It seems a little disingenuous to me, then, that she puts together videos with the attitude of "classes are boring" and "students don't need to pay attention". For a lot of students, classes are their only chance to engage with topics such as math or science. Most people aren't fortunate enough to have a parent who is a professional scientist or mathematician. It might not appeal to adults who feel they suffered through boring classes in their school years, but how many more kids could she encourage to engage more in their classes if her videos said something like: "Hey, ask your teacher in class about this. If you show interest in it, your teachers will likely respond to that interest!" But, more importantly, it would be great to remind students that learning takes work. You don't become an expert on graph theory just because you've watched a four minute video on doodles. This is something I know, but I have to constantly remind myself of anyway. If I really wanted to make the third doodle game work, I could do it, but I would have to put in the effort and time to be able to do it. Vi Hart's videos not only miss the opportunity to encourage students to think that way, they might be inadvertently sending students the exact opposite message.